Relax in your luxurious studio where your backyard is the ocean. Beautiful oceanfront setting where the waves splash just outside your room. Your comfortable bed is less than 35 feet from the ocean. Enjoy the gourmet kitchen & fabulous views in your own private tropical bungalow. Studio guests have their own private covered lanai, separate entrance & parking area. It is said we have the best location on the entire stretch of Alii Drive... we're located near the very end of Alii Drive overlooking Kahalu'u Bay. The studio is on the north side of our property which is bordered by an ancient Hawaiian temple called the Ku'emanu Heiau that is dedicated to the sport of surfing. Adjacent to the temple is the historical St. Peter's Little Blue Church & Kahalu'u Beach Park, one of the best snorkeling spots on the entire island and only a two minute walk. If you would like even more room, please inquire about our 2 bedroom home next to the studio (VRBO#12805). Both have spectacular ocean views for sunsets and whale, dolphin, and surfer watching. Although close to shops, restaurants, and downtown Kailua-Kona, privacy is well assured. Swimming, snorkeling, diving, boating, fishing, surfing, sailing, kayaking, golfing, hiking, horseback riding, shopping, and volcano watching are just some of the exciting things to do on the Big Island of Hawaii. Come and enjoy . . . live aloha! * $300 refundable Security Deposit. * $95 Cleaning Fee for studio. One step up into studio. We have stayed here before and it's a great spot right on the ocean. Perfect for a couple! We loved this little cottage. It had everything we needed and we really liked being so close to such a great snorkeling spot. We also really enjoyed being right on the water and having a nice patio to sit out on. Would definitely stay here again. Being right on the ocean edge, watching surfers, waves and sunsets was so relaxing. The studio had everything we needed including beach chairs that were perfect for beach and for watching stars on Mauna Kea. Snorkeling was amazing, and we could just walk there. As suggested in the owner's info, the kiosk at the beach provided quality snorkeling gear at a good price. Location was great to get to beaches, coffee farms, shops and South Point. We had a lovely 5 days at the studio. Loved seeing the eels in the evening and the great sunsets. Watching the surfers, the boats passing by and the moon was very enjoyable. The perfect place for us to hear the roar of the ocean. It does get the afternoon sun which is quite bright and hot. An outdoor umbrella would have allowed us to sit outside and have some protection from the sun. Our stay in this delightful studio apartment was wonderful! The location was superb -- right on the water with the waves almost reaching the seawall. My husband and I really enjoyed sitting on the lanai, watching the surfers in the morning and the beautiful sunsets at night. A large supermarket/shopping center was within a 5-minute drive ( so we were able to get all the foodstuffs to prepare simple meals in the well-appointed kitchen), and the restaurants and shops of Ali'i Drive were about 15 minutes away, which was convenient, but not in the midst of all the tourist bustle. The apartment itself was charming -- very comfortable and nicely decorated with Hawaiian pictures and artifacts, giving it a homey touch. Julie was a great host, responding to all of our questions immediately. 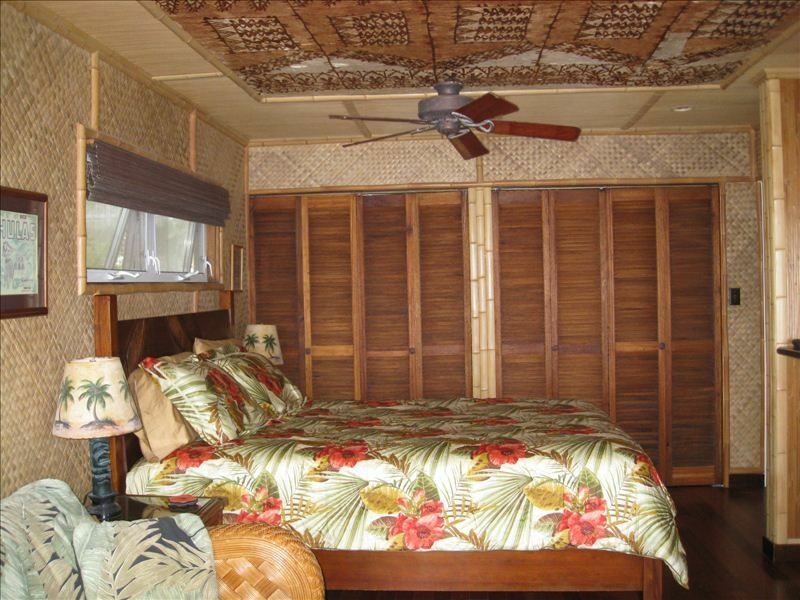 We wholeheartedly recommend this lovely studio to anyone visiting Kailua Kona.